Eye-Fi has released a Mac beta of its desktop receiver for the Mobi wireless SD card. The Eye-Fi Desktop Receiver for Mac follows last month's release of an analogous beta for Windows. This software allows the Eye-Fi Mobi card to instantly transfer images directly from the camera to the Mac desktop, providing Mobi and Mac users with a major new option for photo and video transfer. The Eye-Fi Desktop Receiver for Mac works only with Eye-Fi Mobi cards and is not compatible with ProX2, Connect X2, or any other generation of Eye-Fi cards. It's compatible with Macs running OS X 10.8 or higher. There’s no word yet how long the Mac or Windows versions will be in beta before final release, however Eye-Fi is hoping to gather customer feedback on these new products before the actual launch. Available for free during the beta period, the Eye-Fi desktop software will offer the same features that Mobi customers are familiar with on their mobile devices, including a pairing setup with a 10-digit activation code, built-in Wi-Fi, compatibility with a range of cameras, and auto backup. Pricing for the full release was not disclosed. Just download the beta and enter the code from your card's packaging. If you install this beta, it will remove previous versions of Eye-Fi desktop software from your computer. To turn off the automatic connection, click the Eye-Fi icon in the top bar and close the application. If you want re-enable photo transfers to your computer, run the Eye-Fi Mobi Receiver application again from the applications folder. 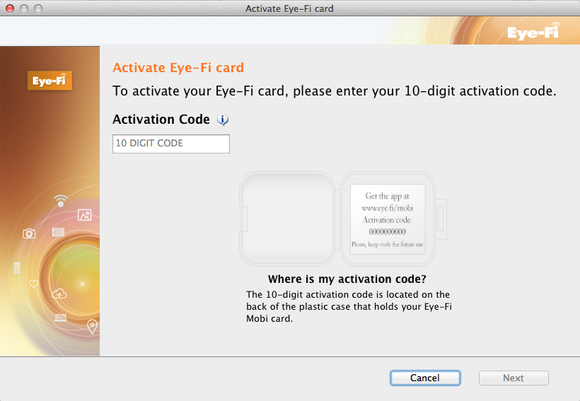 Since the Eye-Fi Desktop Receiver for Mac connects directly to your Eye-Fi Mobi card, you will not have access to other network resources during photo and video transfer. However, Eye-Fi says networked drives, email, and the internet will automatically resume once all photos and videos have been transferred from your Eye-Fi Mobi card to your computer and the camera is switched off. Eye-Fi says it is looking to add more flexibility to this process. Moreover, the Eye-Fi Mobi card can transfer photos and videos to only one device at a time (smartphone, tablet, or computer), so once photos or video have been transferred, they cannot be sent to an additional device. Eye-Fi will preview its Mobi card software and new features at CES 2014 in Las Vegas from Tuesday through Friday at Eye-Fi’s booth (LVH MP40020), and at Showstoppers on Tuesday. In related news, Eye-Fi is also launching Eye-Fi Labs, an experimental platform for users to preview and test the company’s upcoming mobile apps and product features in advance of public release. Eye-Fi’s product development teams will communicate directly with Lab participants to refine products based on customer feedback. Users can register for the Labs program to participate.